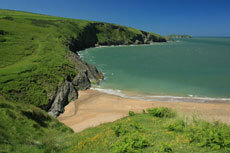 There are so many beautiful beaches in west wales that it is impossible to list them all here. Below is a small selection of the closest beaches to our accommodation. 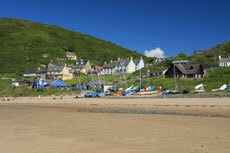 Mwnt is a short walk away and Tresaith and Llangrannog you can reach along the coastal path. 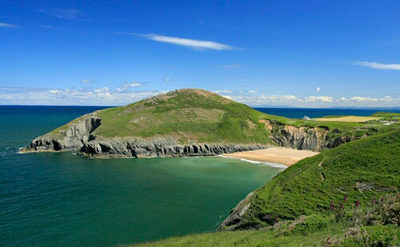 Sheltered sandy cove, Mwnt is owned by the National Trust. This stunning beach is off the beaten track but there is parking in a field above the beach. Swimming conditions are considered safe at Mwnt but there is no lifeguard service here. A well-trodden path circles Foel y Mwnt, leading to the top of the hill which overlooks the beach. The coastal path passes close by from where the local dolphins can often be seen. Tresaith is set in a small sheltered sandy bay named after the River Saith which cascades as a waterfall over the cliffs to the beach. The beach is very popular with families during the summer offering safe swimming and rock pools. The second beach is accessed by crossing below the waterfall. There is a café, a first aid post, a shop and a Pub providing lots of tables inside and out, for meals overlooking the beach. 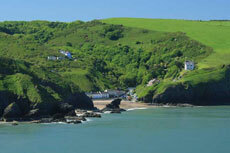 Llangrannog is an excellent beach all year round. Popular with families, surfers or just for relaxing and watching the world go by from the many excellent cafes and pubs. You can choose from traditional pub food overlooking the sea, or home made ice cream at the beach cafe. From the main beach at Llangrannog it is possible at low tide to walk round to the second beach, or or by the cliff path which climbs by steps next to the Quay Café at any time.